FILE - Lara, who was born with microcephaly, is examined by a neurologist at the Pedro I hospital in Campina Grande, Paraiba state, Brazil, Feb. 12, 2016. The World Health Organization has convened seven meetings since early February with experts on various aspects of the Zika virus. While the body of scientific knowledge about the virus is building rapidly, WHO Director-General Margaret Chan says the more that is known, the worse things look. WHO reports there is growing evidence that Zika is linked with Guillain-Barre syndrome, microcephaly — a brain disorder in children —and other severe disorders of the central nervous system. "A pattern has emerged in which initial detection of virus circulation is followed within about three weeks by an unusual increase in cases of Guillain-Barre syndrome,” Chan said. “Detection of microcephaly and other fetal malformations comes later, as pregnancies of infected women come to term." WHO reports 6,480 cases of microcephaly are suspected, mostly from northeast Brazil. Investigations have been carried out on 2,212 cases, and 863 are confirmed to have brain abnormalities. Panama has reported one suspected case of microcephaly, and Colombia is investigating several cases of the abnormality in babies for a possible link with Zika. 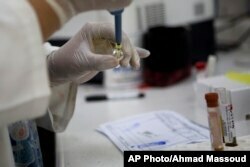 FILE - Blood samples from pregnant women are analyzed for the presence of the Zika virus, at Guatemalan Social Security maternity hospital in Guatemala City, Feb. 2, 2016. In other countries and territories, Chan says the virus has not been circulating long enough for pregnancies to come to term. A WHO team is in Cape Verde to investigate the country's first reported case of microcephaly. Chan says a high-level meeting convened by WHO looked at the scientific evidence linking Zika infections with malformation and neurological disorders. "Though the association is not yet scientifically proven, the meeting concluded that there is now scientific consensus that Zika virus is implicated in these neurological disorders,” she said. “The kind of urgent action called for by this public health emergency should not wait for definitive proof." Currently, the Zika virus is circulating in 38 countries and territories. Chan says it is difficult to predict whether the virus will spread to other parts of the world. However, she warns, the world will face a severe public health crisis if the same pattern is confirmed beyond Latin America and the Caribbean.